A rare proof issue of the first map to depict Manhattan as an Island and to depict a beaver. 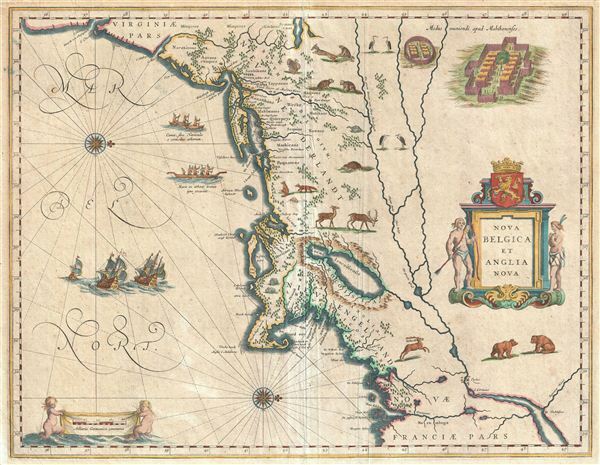 A beautiful example of one of the most important maps in the history of America, Blaeu's 1635 Nova Belgica et Anglia Nova. Oriented to the west, this map covers the American coast from Virginia, past New York and Long Island to Cape Code, New england, and Quebec. It is cartographically derived from data accumulated by Adriaen Bock and other Dutch fur traders active in the early 17th century. It is known for a number of important firsts, including the first printed representation of Manhattan as an Island. This important map was one of the most attractive of the Americas at the time. It is noted for the fact that its primary source is the first manuscript figurative map of Adriaen Block, 1614. Indeed it is the first full representation of it in print. It is one of the earliest to name Nieu Amsterdam. Block, a Dutch fur trader, explored the area between Cape Cod and Manhattan, examining the bays and rivers along the way. This helped to create an accurate picture of the longitudinal scale of the coastline. His manuscript map is the first document to delineate an insular Manhattan; it also provides the earliest appearance of Manhates and Niev Nederland. It has been noted that the time difference between 1614, the date of the manuscript, and Blaeu's map whose first appearance is in 1635, appears long for such an important advance. It would seem highly feasible that Blaeu, who published many separately issued maps, would have wanted to produce one like this sooner. However, evidence points to the fact that it could not have been made before 1630. The Stokes Collection in New York possesses an example of the map on thicker paper without text on the reverse which could well be a proof issue of some kind. There are features on Blaeu's map that differ from the Block chart. Some of these could be accounted for by the fact that the surviving figurative map is not the original, and that the copyist omitted some place names that are referred to in the text of de Laet's work. Block drew on Champlain's map of 1612 for the depiction of the lake named after him, but it is here called Lacus Irocoisiensis. … The lack of interrelation between the Dutch or english colonies and the French, led for some time to the eastward displacement of this lake when its true position would be north of the Hudson River. Some nomenclature has its origins in Blaeu's second Paskaert of c.1630, and others, such as Manatthans, in de Laet. The colony of Nieu Pleimonth is identified. This and other english names along that part of the coast are largely derived from Smith's New england, 1616. Cape Cod is here improved over the Block manuscript by being reconnected to the mainland, the narrow strait having been removed. The coastline between here and Narragansett Bay, which can be clearly recognized, is not so accurate. Adriaen Blocx eylandt leads us to the Versche Rivier, or Connecticut River, which Block ascended as far as was possible. 't Lange eyland is named; however, it is incorrectly too far east, being applied to what is possibly Fishers Island. De Groote bay marks Long Island Sound. The Hudson River is still not named as such, but is littered with Dutch settlements, and the failed Fort Nassau is here depicted renamed as Fort Orange. He does, however, improve on the direction of its flow. Blaeu separates the sources of the Hudson and Delaware Rivers which had been causing some confusion. Nieu Amsterdam is correctly marked as a fort at the tip of an island separated on the east side by Hellegat, or the east River. The coastline south of Sandy Hook also shows signs of improvement. It is of note that this map was issued in a number editions but only a single state. editions are generally identified by the text appearing on the verso with twelve documented editions, three each in Dutch, Latin, German, and French. Though undeniably authentic, this example is blank on the verso, suggesting that it was an independent issue unconnected to the major Blaeu atlas releases. The only other example we are aware of with no text on the verso is located in the Stokes Collection of New York. Burden suggests that the Stokes example may well be a proof of some sort. The same may be true of this example – making it doubly significant. Very good condition. Original centerfold. Blank on verso. Platemark visible. Even overall toning. Margins appear to have been trimmed but remain ample. Additional older crease about three inches to the right of centerfold. Small spots of old tape relating to framing appear on verso. Burden, P., The Mapping of America: A List of Printed Maps, 1151-1670, 241. Van der Krogt, P. C. J., Koeman's Atlantes Neerlandici, (3 Vols), 9310. McCorkle, B. B, New England in Early Printed Maps 1513 - 1800, 635.1. Schwartz & Ehrenberg, The Mapping of America, pl. 58. Goss, J., The Mapping of North America: Three Centuries of Map-Making 1500-1860, pl. 2.